The dust has settled on the 2018 FIFA World Cup. With the final whistle clouds gathered over the Luzhniki and as France lifted the trophy the sky opened up almost as if the heavens were sad that the World Cup in Russia has come to an end. It was indeed, a fantastic tournament that had a great conclusion with a 4-2 final victory by the new champions France. There is no doubt that France are the deserved champions. Perhaps the only criticism against the Equipe Tricolore is that head coach Didier Deschamps never used the full potential of his squad. Just imagine a side that can leave the likes of Thomas Lemar, Nabil Fekir and Ousmane Dembélé for much of the tournament on the bench. Others like Karim Benzema and Anthony Martial did not even make this squad. At the same time, France only convinced twice throughout the tournament. Their 4-3 victory over Argentina was perhaps the fascinating game at the tournament. Finally, their 4-2 victory at the final against Croatia was also a demonstration of strength – after Croatia scored their second goal to make it 4-2 France shut shop and never really gave the Vatreni a chance to get back into the game. Luka Modrić may have had a pass completion of over 90% but even the Real Madrid midfielder did not find a way through France’s well-organised defensive lines. 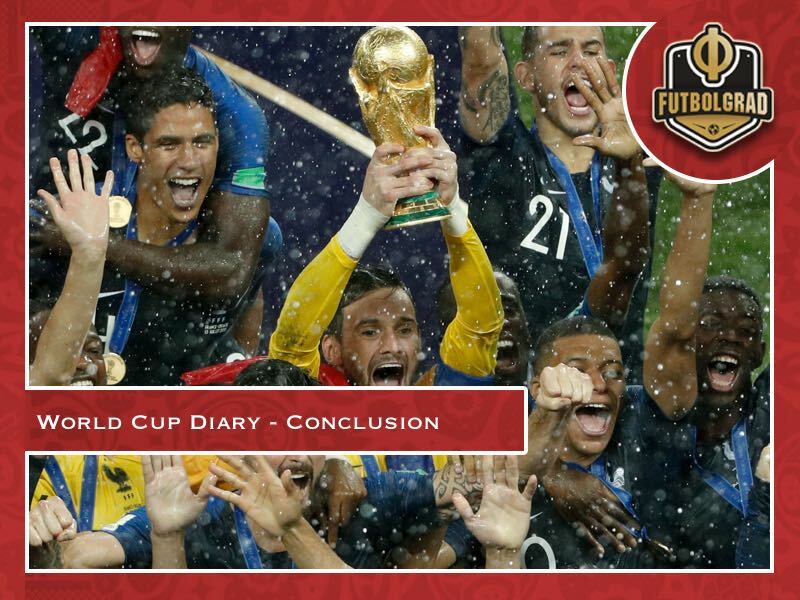 France’s World Cup triumph is, therefore, one of pragmatism. Deschamps did not rely on attacking fireworks but defensive pragmatism to become only the third person, after Mario Zagallo and France Beckenbauer, to win the World Cup as both a player and a coach. The conclusion to France’s victory, therefore, is that success at a short tournament can only be achieved on a strong defensive foundation – even if you have one of the best-attacking sides on the planet. Is France the model for other countries? It seems to be standard policy to look at the world champions and to come up with some grand political statements. “It is the France we all love”, Antoine Griezmann answered after being asked about the multicultural background of this France side. France are indeed a side that includes nationalities from all over the world. Fifteen members of France’s 23-man squad are of African descent. Others like Lucas Hernandez have mixed European heritage. It has, therefore, been no surprise that this French side has been deemed as a success of multi-culturalism. 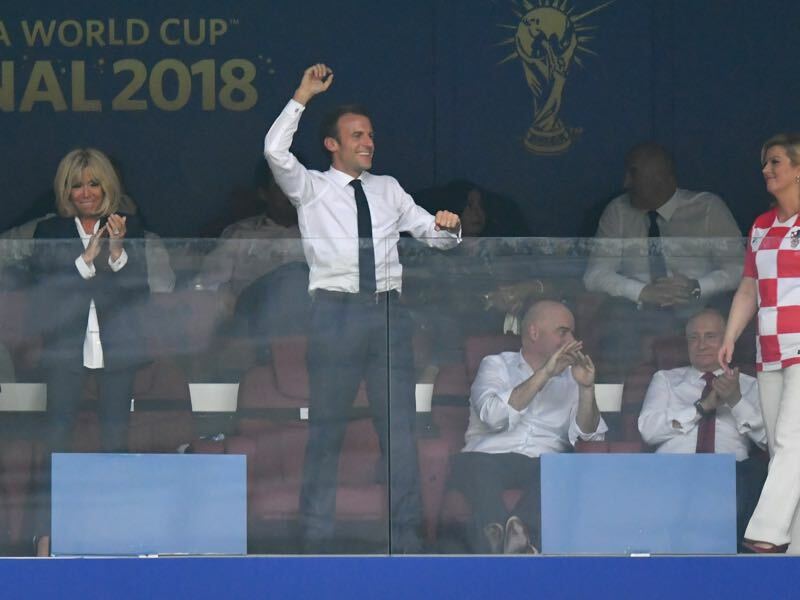 Add to this pictures of passionate French President Emmanuel Macron celebrating inside the Luzhniki, as well as images of him celebrating with the France side in the dressing room, and you get a feeling of a hip and modern nation. But is this a true image? The Futbolgrad Network spent some time in France at the buildup of this tournament. What we found was a nation deeply entrenched with their current President and at odds with a national team that did not always seem to reflect the country as a whole. True, images of the party at the Champs-Élysées and the Eiffel Tower show that French fans were happy about the triumph. But at the same time, very few came to Russia to witness the triumph in person. Furthermore, how much will the triumph help to change the deep-rooted problems of the country? Superficially there might be some change. But four-years ago Germany had just won the World Cup with a multi-cultural squad. Four-years later the DFB (German football association) blamed Mesut Özil and, to a certain extent Ilkay Gündogan, for Germany’s disastrous World Cup campaign after the two had met with Recep Erdogan ahead of the World Cup. It has been a campaign that shows the broader problems of German society and a government party, represented by DFB President Reinhard Grindel and sporting director Oliver Bierhoff, that still seems to be at odds with immigration and integration. The question now, of course, is whether France can escape similar problems in the long-run. For now, the World Cup, like the one four years ago for Germany, has been a triumph of multiculturalism, but will it be one for integration as well? Only time will tell, but it will most definitely take more than a Chancellor shaking hands in a dressing room with a Turkish player or a President learning how to do the dap with players of African descent for integration to work. Croatia’s conclusion to the World Cup was one of disappointment. The fans may have come out in full force in Zagreb to the party, but the small country may never again have the chance to win a World Cup. “We showed the world that small countries could achieve great things”, head coach Zlatko Dalić explained at the press conference following the World Cup final. This is true. Overall, the world has only seen eight different world champions. Only 13 countries have reached the World Cup final, and ten of those were from Europe. The football hierarchy, in other words, is very much set in stone. Croatia, in fact, have been the smallest country from Europe to ever reach the World Cup final. Croatia are also the smallest country since Uruguay, in 1950, to reach the final. Furthermore, the Vatreni are the smallest country since Sweden in 1958 (population 7 million) to come close to winning the title. Even slightly bigger countries like the Netherlands have failed to win a title, which makes football, unlike other sports, almost a closed shop. The bottom line is Croatia’s victory would have highlighted that smaller countries can reach for the stars and win titles. But football is very much about resources and the big football countries with a bigger population base and resources tend to have closed the shop in their favour. Much was said about Russia ahead of the tournament. Problems about racism, homophobia, human rights and hooliganism were highlighted by the media when it came to Russia hosting the tournament. While there never seems to be any doubt that racism and hooliganism would be no issue at the tournament issues such as human rights and homophobia remain a significant issue in Russian society. But where western media overplayed problems ahead of the tournament the English-speaking press completely downplayed many of the persisting problems throughout the tournament. It is true that this was a great tournament that was perhaps among the best when it came to the organisation. As often pointed out on the Futbolgrad Network there was, however, never really any doubt about that aspect. We often pointed out that hooligans seeking to slaughter travelling fans would not confront visitors. Furthermore, while racism exists in Russian stadiums, it was unlikely to become a major issue at a FIFA organised tournament. Hence, while those issues were not persistent and the western media all fell into the trap of sugar-coating the tournament questions remain. Homophobia and human rights issue remain a big problem -, especially in the Southern Caucasus. Also, the tournament may have been a success, but there are also questions about corruption and what will happen to the facilities constructed with the massive help of state funds. There is nothing wrong with highlighting that FIFA and Russia organised a wonderful tournament – which they did. But the conclusion is that media got it wrong both ahead of the tournament and throughout the tournament. We have to ask tough questions, not just in Russia, but in general when it comes to football. Hence, for the Futbolgrad Network, the legacy of this tournament will be to remain active in the region and to keep looking beyond the imagined curtain to bring you the good, the bad and the ugly about football in the post-Soviet space and the Balkans. The conclusion, however, is that we feel privileged to have covered this tournament. We want to thank the Russian people for hosting us and everyone else who supported, read and listened to us throughout the tournament. It would not have been possible without all of you. Spasibo and do svidanye.